You have bed bug infestation if you always wake up itching all over. These pests leave you scratching throughout the night and well into the morning, leaving red, ugly-looking bumps on your skin. 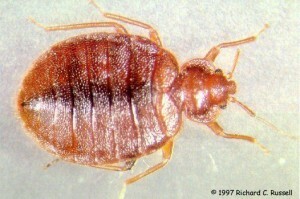 Bed bugs are tiny parasites that live in bed sheets and mattresses. These critters breed at a fast rate, providing big problems for those who long for uninterrupted sleep. Worse, they can transfer to clothing, creating a full-blown problem and making extermination more difficult. Adios Pest Control can zap those bugs dead and provide a good night’s rest for you and your family. The process involves the application of concentrated heat to the affected area. This approach is non-toxic and non-chemical, which means there are no side-effects. Heat treatment handles adult mites and gets rid of their eggs, too. A single application will take care of your bed bug problem entirely. Client safety is our top priority, and we make it our business to give the comfort and service you deserve. We will take care of your bed bug problem and show you why we are leaders in our industry. Contact us right now and free your home from bed bug infestations.